Window Dressing - What Does It Mean? What is the definition of "window dressing"? "Window dressing" isn't illegal, but it certainly is deceptive. You have likely watched CNBC or Bloomberg before, and heard the term "window dressing" used. 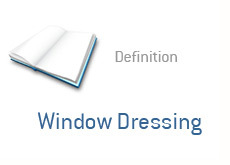 The term "window dressing" applies to a number of different things, but for this definition, we will be referring to "window dressing" as it applies to the mutual fund industry. Let's take a mutual fund. We'll call it the XYZ Income Fund. Every three months, the XYZ Income Fund will send a mailout to all of their investors. Included in this mailout will be a list of all of the stocks that the fund is currently holding. Let's say that Google has had a very good quarter, and has traded up over 20%. Let's also say that the XYZ Income Fund currently owns a position in AIG, which has been doing unbelievably poorly. The managers of the XYZ Income Fund may decide to perform a bit of "window dressing" on their fund at the end of the quarter. The managers may decide to sell their position in AIG on the last day of the quarter, as well as buy a position in GOOG. The end-of-quarter mailout will then be sent to investors shortly thereafter. According to the mailout, the XYZ Income Fund currently owns Google, and there is no mention of their position in AIG. Now, the fund has a loss for the year on their position in AIG, and they would have missed out on the 20% upwards swing in Google. So why would they execute these two transactions? The simple answer - to make themselves look better. It's a shady and deceptive practice, but it isn't illegal. Should it be? That's another question altogether.